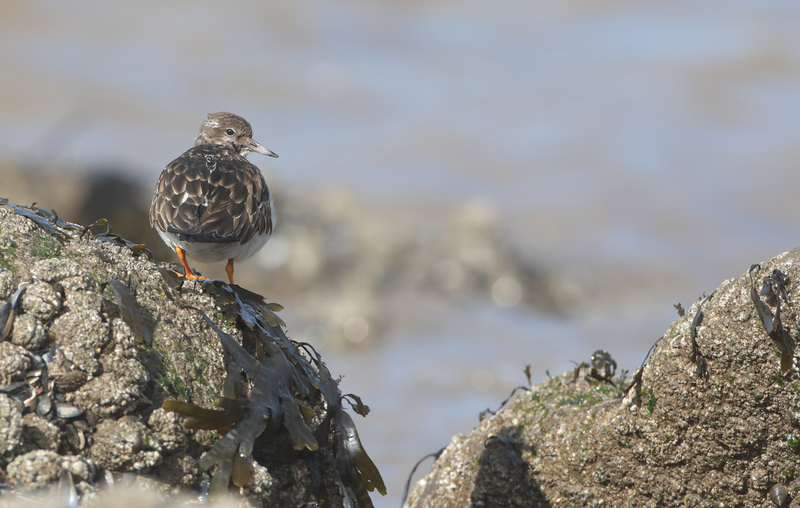 I take a lot of pictures of Purple Sandpipers at high tide. Not so many of Turnstones at low tide. The conventional wisdom would have you watching and photographing birds on the rising to full tide. This seems reasonable as when the tide floods the birds become corralled by the enveloping waters on to a narrower and narrower stretch of beach, getting closer to shore each minute. There they roost and as they assemble and settle they are easier, in theory, to watch and photograph. Thurstaston Shore on a rising tide is spot on for photographing Blackwits and Hoylake on a big spring tide can be breath-taking. Stumble across a roost on Hilbre Island and you can have a prolonged period with the birds at close quarters for great viewing and a decent stab at getting some pictures. As I dawdled towards the island this particular morning I was wondering what to shoot. I was on early and I followed the tide out, stopping at Middle eye to wait for the safe route to become visible as the tide dropped. 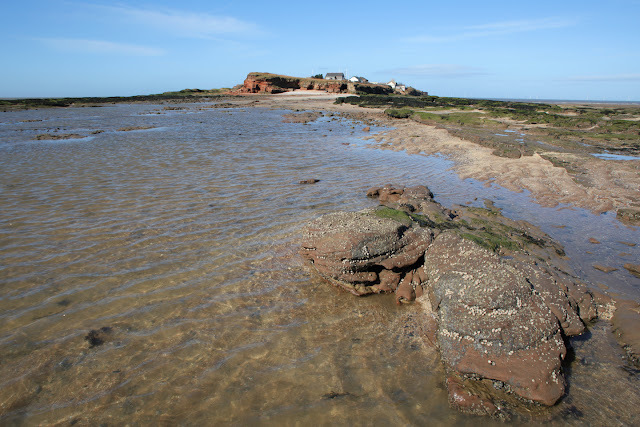 The tide was receding much as my hairline was – slowly but with a creeping inevitability. 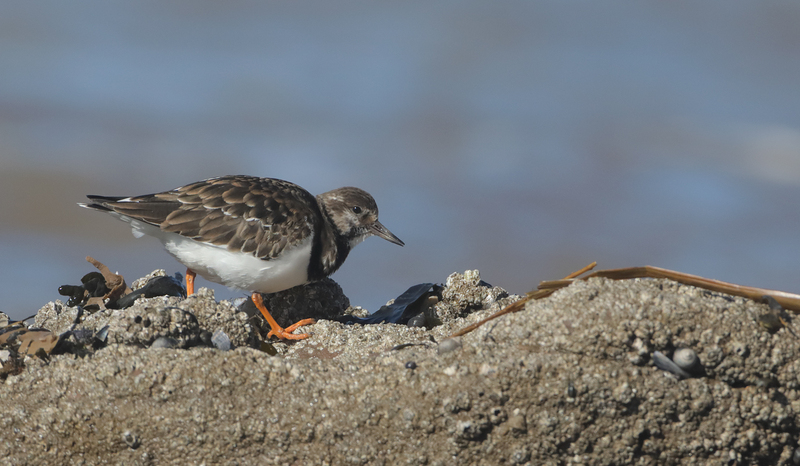 Once on the main island it was clear that the hoped for slew of early spring migrants was a wildly optimistic idea. A couple of Meadow Pipits chased each other over the paddocks and a White Wagtail called overhead. No Wheatears bounded along the west side and the skies were bereft of Sand Martin. No matter. I wandered down to the cliffs overlooking the whaleback in the hope of finding a colour ringed Brent Goose. 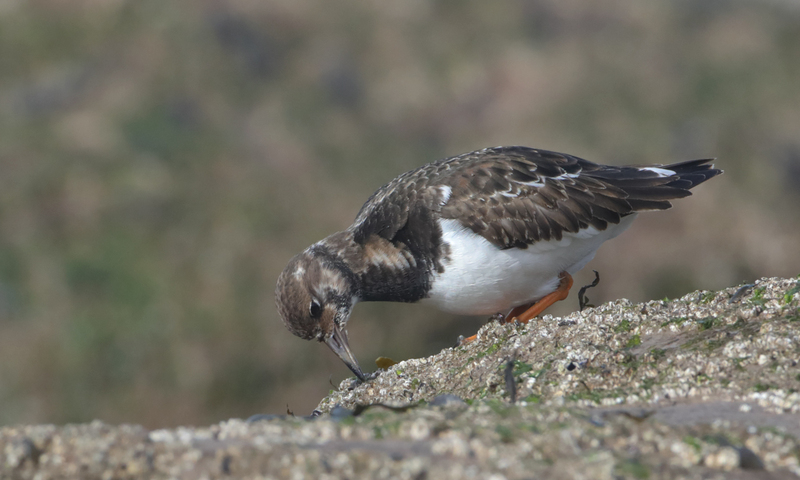 Down on the edge of the tide Turnstones were picking their way through the rocks looking for food. With not much else to point the camera at I thought I’d give them a whirl. 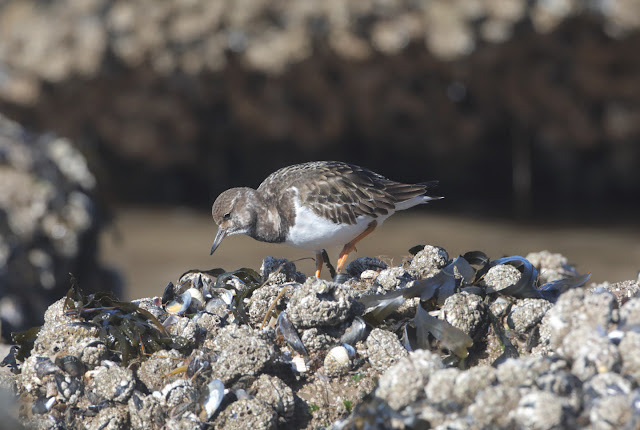 I started the steep descent to the shore at Shell Bay thinking this was a good idea as there is a small gap in my Hilbre catalogue that I could fill with Turnstone pictures. The going was treacherous. Still wet seaweed was so slippery I thought about abandoning the idea after a couple of wobbles. Camera and attached lens don’t bounce. The beach at Shell Bay gives way to rocky shore with some pretty large boulders so I had cover to sneak towards the breaking waves. 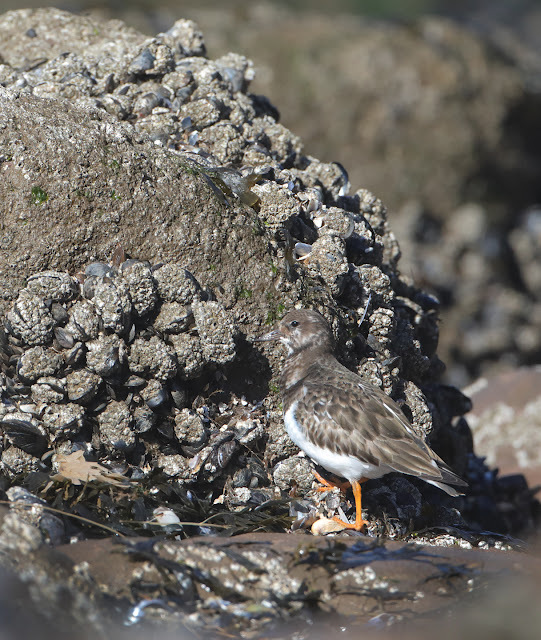 The birds were foraging on the edge of the tide, enjoying the freshest seafood. I found a suitable rock and hunkered down behind it so the birds could carry on undisturbed while I fired off a few hundred frames in the intermittent sunshine. Over the course of a couple of hours I grew more and more fascinated by the world these birds occupy. I am more than familiar with these islands but I will admit that I have been too ignorant of the rocks and all that lives on them. 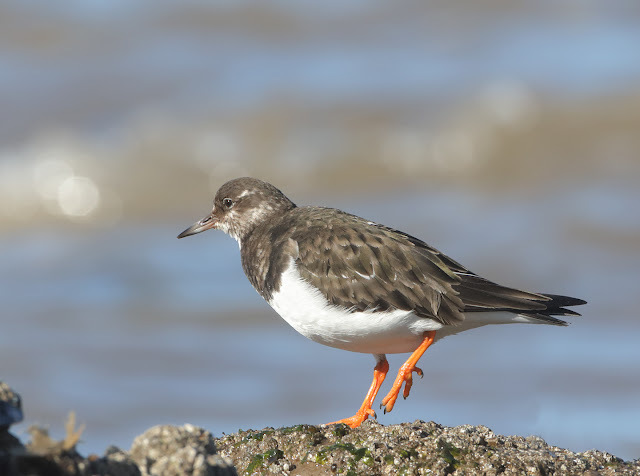 To watch and record the Turnstones is to be taken into this glittering post-tide world. The sights, the sounds and the smells. 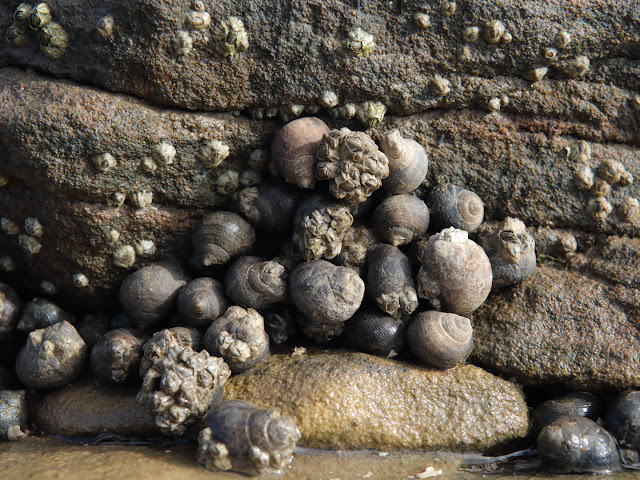 The textures too; slime like seaweed, granular shell sand, calcareous – chalky barnacle shell. This place is smothered with life. Every possible space has been occupied by something. Look around and whatever surface you see there is some creature or plant adhered, cemented, fixed in defiance of the roaring sea. When I first arrived I thought it looked messy and chaotic, everything on top of everything else. 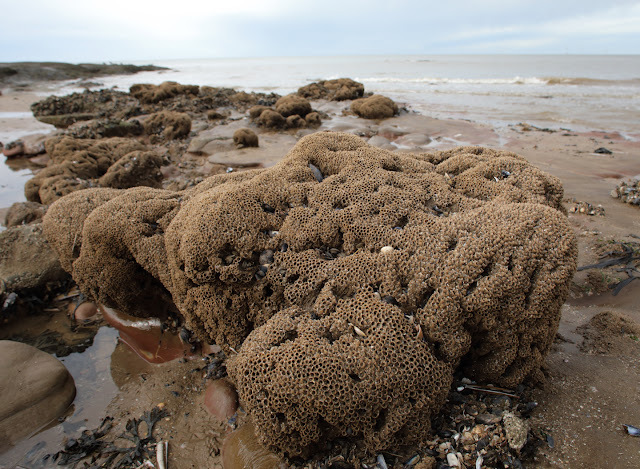 These creatures were living all over each other, like the most overcrowded city on the planet. After no time at all I was hooked. This glistening world, refreshed with the tidal waters of Liverpool Bay thrived and heaved in front of me. It seemed so fresh while smelling a bit like off fish. Fresh like a baby out of a bath. The birds moved through it peering into empty barnacle shell, flicking seaweed fronds and poking at periwinkles. To my left I spot a Sabellaria alveolata reef. 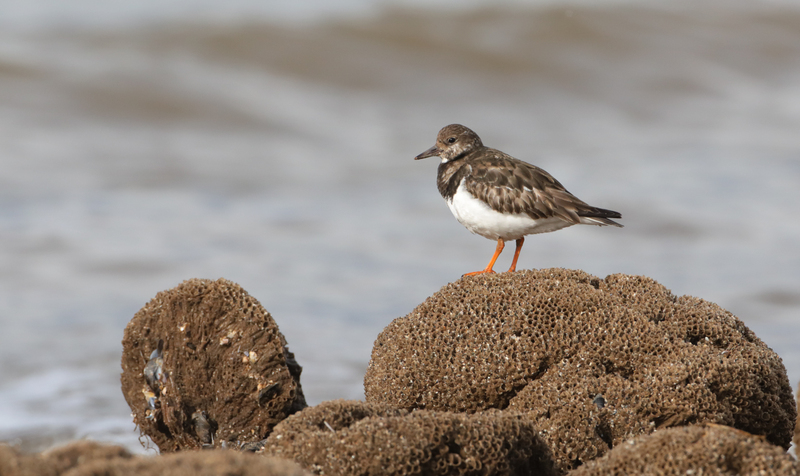 These colonial worms make sandy burrows like a honeycomb, the Turnstones climb over them, inspecting chambers for a meal. I shift my position as the sun moves and as I do I come across a beached jellyfish. I take its picture and afterwards, looking at the image on the computer, I see my reflection in a bubble in the pool it is stranded in. I nudge it with a wet welly boot then settle in to get more pictures of the Turnstones. I am struck by how out of place I am here. I feel… really… terrestrial. These creatures are so different but utterly amazing. The dropping tide had revealed wonder I had, until now, unforgivably ignored. The pictures stacked up and soon the tide turned. It isn’t wise to linger longer than you have to on the rising tide so I retraced those treacherous steps to the island then worked my way back to the mainland wondering where I had just been. A new world on the small island I know so well.